As a member of the Pitch List I was offered a chance to review a Patch Products Game. I accepted because I wanted something fun to do when there is nothing to watch on TV and my husband and I are bored! 🙂 I chose to review a Flash and Furious game, and I’m glad I did, it is a pretty fun game! Are you ready to be flashed? Everyone hears the question and thinks it’s soooo easy, but once the random 2-second flasher gets going, you could be caught off guard or even left speechless. You gotta be ready for surprise turns and stolen answers in this frantically fast, fantastically fun game! Get Ready to Think Fast and Have Fun with Flash and Furious! 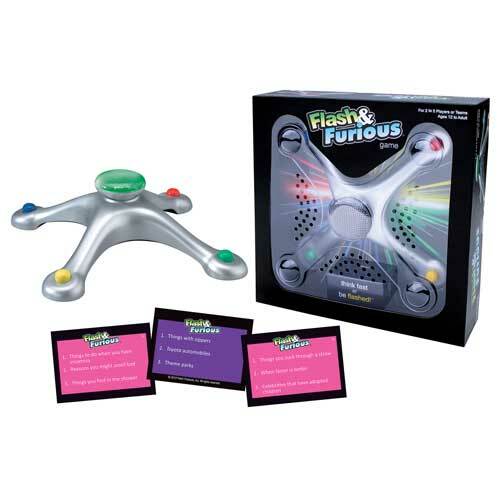 Flash and Furious is a new party game from Patch Products. It is a simple game, but not so easy to play! Take the game and cards out of the box and you’re ready to go! Pick a color and tap in by pushing the button on the game flasher. Once everyone has checked in, you are ready for your first question. Read the question out loud – for example, “High School Sports” – tap the large center flasher button. A color will shine and the corresponding player or team has to call out an answer before a new color flashes. Sounds easy and fun right? Almost a bit like Charades! Visit the Patch Products Website for more great games for all ages. You can also find them on Youtube, Instagram, Twitter and Pinterest. We received the Patch Products Flash and Furious Game (MSRP: $39.95) for this review. We received no monetary compensation and we were NOT required to do a favorable review. Aside from information taken from the company, the opinions are our own. We only recommend products or services we will use personally and/or believe will be good for our readers. Our reviews and giveaways are in no way affiliated with Facebook, Twitter, Pinterest or Google+. We are in no way liable for any injuries that may result because of use or misuse of any product we recommend. For more information please read our policies Here. My daughters love playing games and having a game night. These Patch Games are the best.